Whenever my husband wears a kippah – an admittedly rare occasion – he dons a colorful crocheted circle swirling in blues, yellows and browns. 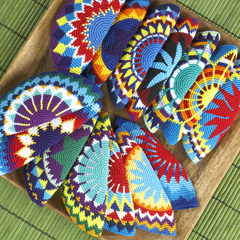 Kippot like his are the work of a handful of Mayan women in Guatemala, who have partnered with MayaWorks, a Chicago-based organization to produce beautiful fair-trade ritual objects, purses and clothing. The colors on my husband’s kippah were chosen by the women of San Marcos la Laguna, a small village on the shores of Lake Atitlan. The women began crocheting kippot about 10 years ago, after a Jewish tourist traveling with MayaWorks saw them making hacky sacks. “If they can make hacky sacks, they can make kippot,” the tourist remarked, says MayaWorks executive director Jeannie Balanda. That off-hand remark started an effort that now constitutes the artisans’ best-selling product. 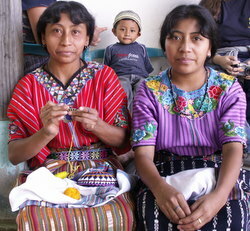 Besides hacky sacks and kippot, the 40 San Marcos artisans crochet baby hats and shoes and pouches. Each kippah takes about three to four hours to complete. At first the shape was troubling – some kippot would be really round or really flat, says Naomi Czerwinskyj, MayaWorks product manager. Eventually, with the help of a head dummy, the artisans found the right shape: neither pancake nor Sephardi-style hat. For the first couple years, the kippot makers didn’t actually know what they were making. But another traveler brought a story about the importance of a kippah in the Jewish tradition – the sign of reverence for God. That’s made the crochet specialists even more respectful of their own work, Balanda says. The MayaWorks scenario is far from a sweatshop: the organization not only provides market-rate payment for the artisans’ work and supplies, but also scholarships for their children, micro-loans to improve living conditions, and additional training. The artisans create their own patterns, make decisions on whom to include in their craft group, and brainstorm ideas for new products. That’s no small thing in traditionally macho Guatemala. Add in the long-existing prejudices against indigenous people, and the value of having a market for their products becomes clearer. 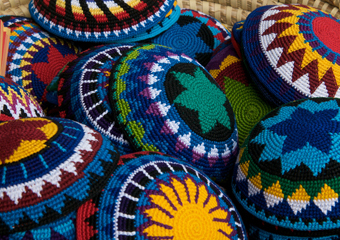 The kippot makers are among seven groups of women engaged with MayaWorks. Most are weavers, a traditional craft young girls learn from an early age. They start by making huipiles, blouses made out of hand-woven panels decorated with an array of birds, flowers and vines. The MayaWorks artisans have transferred some of these rich patterns onto the products they make – including other Judaica: the mezuzah covers, banners proclaiming shalom and, most recently, tallitot and tallit bags. Of course, Jewish ritual objects are not the only products. The MayaWorks warehouse in Chicago is a treasure trove of eye-glass cases, tablecloths, decorative wall panels, purses, Christmas tree ornaments and headgear. The colors and patterns that first drew my husband to his kippah are a powerful symbol of what Maimonides taught 800 years ago: the best way to help someone is to give them the resources to help themselves. Since discovering the kippot, we’ve given MayaWorks headgear as gifts to our extended family. 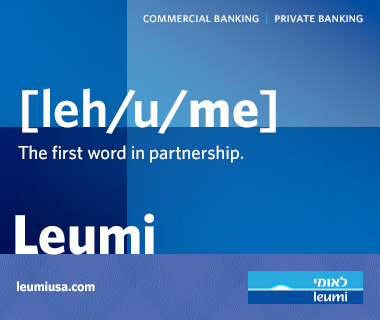 They’re more than a mark of our Jewish heritage. They’re a symbol of hope.